First came the official announcement that got everyone excited. Then came the “leaked” images that were highly scrutinized by overzealous fans. The final reveal (as far the marketing goes) came earlier today. Cartoon Network finally gave the public its first real glimpse of the new Thundercats series with a minute long trailer. By “real” glimpse I mean that we get to see actual moving images instead of posters and stills. As the clip begins, a group of reptilian creatures are shown slavishly moving in lockstep while chained together. It then cuts to a royal hall were Jaga unveils the Sword of Omens (perhaps during a presentation ceremony of some sort). A young Lion-O is then shown removing the sword from its mount and holding it in front of himself as the eye of Thundera awakens. The setting changes yet again, showing a massive crowd that has gathered in an arena. There is a call back to the opening as the enslaved reptiles are revealed to be beasts of burden powering a chariot. Two giant doors open and horses with Thundercats riding atop them come galloping out. The action then cuts back to the arena, where Lion-O claws his way up giant vines that have sprouted from a pool of water on the arena floor. The following Thundercats are revealed in a quick montage: WilyKit & WilyKat, Cheetara, Tygra, Snarf, and Jaga. 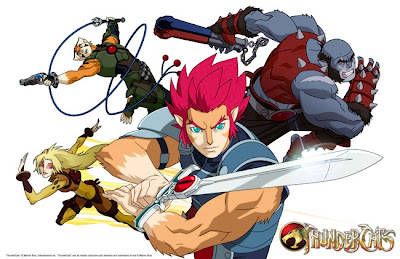 Lion-O is then shown engaged in sword fight taking place in a throne room. The other Thundercats are again shown using their various powers and attributes. The Sword of Omens extends as Lion-O performs the first part of his famous cry. The trailer closes on a reveal of the Thundercats Logo amidst an overcast sky. The trailer is full of pomp and bombast. The images are underscored by a driving musical selection laden with choral chanting, horns, and thunderous drums. This new series appears to be taking its cue from Arthurian Legend and recent fantasy. The animation is adequate, though the moderate frame rate is noticeable. The designs seem a bit less detailed when seen in full motion. We now have an idea as to the look and tone of this new series. The trailer pretty much falls right in line with expectations. This new iteration of the Thundercats is aiming to be what fans mistakenly remember the original to be: a serious science-fantasy series with dark overtones. At the very least, that ensures that its makers are aiming for something that has value beyond whatever toys and merchandise it’s meant to sell.